A British satellite has successfully deployed a net in orbit to demonstrate how to capture space debris. The event took place more than 300km above the Earth. It was part of a series of trials that will showcase different technologies to remove the redundant hardware now circling the Earth. Some 7,500 tonnes is said to be drifting aimlessly overhead, posing a collision hazard to operational missions. 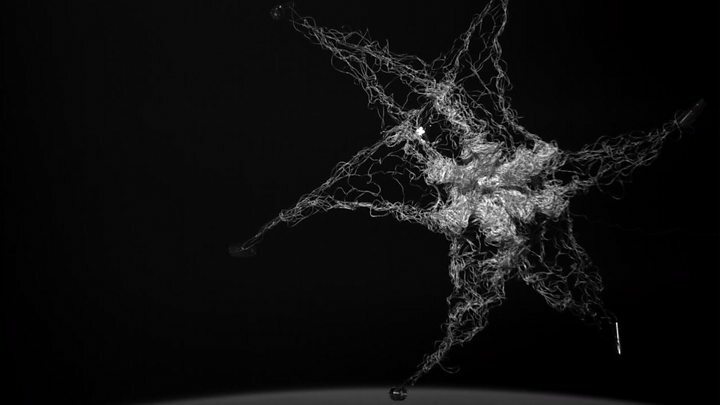 The aptly named RemoveDebris satellite took a video of its net experiment. "It worked just as we hoped it would," said Prof Guglielmo Aglietti, director of the Surrey Space Centre. "The target was spinning like you would expect an uncooperative piece of junk to behave, but you can see clearly that the net captures it, and we're very happy with the way the experiment went." If this were a real capture, the net would be tethered to the deploying satellite, which would then tug the junk out of the sky. As this was just a demonstration, the net and the box (which was actually pushed out from RemoveDebris to act as a target) will be allowed to fall to Earth on their own. Their low altitude means it should take only a couple of months before they burn up in the atmosphere. There has been much talk about the need to clean up space, but the Surrey satellite is the first to try out practical solutions. Shortly, RemoveDebris will test a new camera system to track space junk - again, on a target it has brought along for the experiment. Later, perhaps early in the New Year, there will be a demonstration of a harpoon that can snare junk. And finally, RemoveDebris will deploy a large membrane - what is termed a "drag sail", which will brush against the high atmosphere and pull the whole mission into a destructive dive towards the planet. There are now millions of discarded pieces of metal and other materials in orbit - everything from old rocket segments to accidentally dropped astronaut tools, even flecks of paint. The fear is that if we do not soon start taking this litter out of the sky, it will become a significant threat to active satellites. Alastair Wayman is an engineer with the aerospace giant Airbus, which is also involved in the RemoveDebris project. "If there are collisions, as there have been previously, then they will create lots of space debris. That debris then collides with more spacecraft, and you get even more space debris. It's a kind of snowball effect," he told BBC News. The issue of space junk is particularly pressing because a number of companies are in the planning stages of launching thousands of new satellites. Already there are calls for a tough new approach to licensing these spacecraft that would demand operators be able to bring down rapidly any of their hardware that fails in orbit.